Cracked glass has become a popular design feature used by architects and furniture manufacturers. It is a laminated glass normally made from three layers of glass with a PVB interlayer. The two outer layers will be intact panels bonded to the inner cracked layer. These layers give strength to the glass allowing it to be used in many applications including glazing and interior partitions. It is strong enough to be used in construction of public buildings, for example, airports, banks, schools and hospitals, to name a few. If required the glass can be coloured and can also have additional PVB added to differing thickness of glass to create bullet-proof glass. Cracked glass has also become popular in furniture design and glazed panels. A table will shimmer and sparkle however it is lit. The sunshine will catch and reflect off the cracks and similarly electric or candle light will highlight the interesting patterns within the cracked glass. With glass panelling you can expect to see a slightly distorted image through the glass, however light will still flow through easily. During the 16th century glass makers in Venice developed new processes for manufacturing glass. It became known as Crackle Glass and although there were numerous processes used in its manufacture they all basically involved immersing the glass into cold water while still molten causing the glass to crack. It would then be reheated to seal the cracks and moulded or blown to the desired shape. Even now the same methods are sometimes used when defects appear during manufacture. The glass maker will deliberately crackle it to hide the imperfections in the glass. One of the features of this type of glass is that it reflects light giving it a shimmering effect when viewed in natural or artificial light. 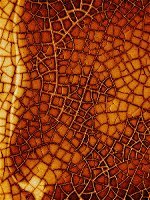 Crackle glass can be manufactured in many colours and can be moulded or blown into many shapes including vases, jugs, plates and lamps, to name a few, it can even be formed into windows. This is another use for crackle glass. It is formed into beads which can then be used to create colourful jewellery. These beads will reflect natural and artificial light the same way as a vase or jug. Each piece of jewellery would be unique as the crackling on every bead will be different.